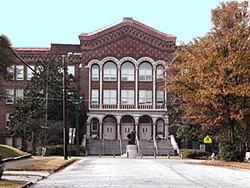 The first black public high school built in Atlanta, Booker T. Washington High School was constructed in the 1920s during the city's major school building program. It was, and still is, an important cultural institution in the black community. The school has produced many outstanding graduates, including Dr. Martin Luther King, Jr., civil rights leader; Romae T. Powell, judge; Dr. Asa Yancy, surgeon; and Dr. Mabel Smith Lott, psychologist. Because of its quality of education, many students came from out of town to attend this school. The school opened in 1924, 52 years after public education started in Atlanta. It remained the only black high school in the city until 1947. The school was named for Booker T. Washington (1856-1915), a Virginia native who had been born a slave and became one of the most influential black leaders and educators in the United States. In 1881 he founded and became the first principal of Tuskegee Institute. Booker T. Washington High School is a four-story building of reinforced concrete with brick veneer walls built in a medieval-eclectic style. It contains 40 classrooms, administrative suite, library, cafeteria, and science laboratories in the main block. The elaborate main entrance contains five arches in two tiers, using terra cotta and Venetian-style columns. Some original roof tiles and mosaic floors remain, as do original doors, high ceilings, and radiators. A statue of Booker T. Washington by Charles Keck was added at the front entrance in 1927. It is a duplicate of the original at Tuskegee Institute in Alabama. In 1938, six classrooms and a laboratory were added as a Works Progress Administration project. A major, half million dollar addition in 1948 filled out the original plan and was designed by the original architect, Eugene C. Wachendorff. Booker T. Washington High School is located at 45 Whitehouse Dr. in Atlanta. It is still used as a high school, and is not generally open to the public.